You know how sometimes you pick up a book and within five pages you begin to savor every word because it’s so damn good you don’t want it to end? Whiskey When We’re Dry and Savage Country are two prime examples. I read a lot; most writers do, and I’m always on the hunt for outstanding Western fiction. I read these two back to back and both are superb. Maybe it was because of this, but I found similarities in them — a wonderfully spare style and strong women characters, and of course, simply great writing. In John Larison’s “Whiskey”, we meet 17-year-old Jesse Harney, who leaves her hardscrabble farm after her father dies, disguised as a man and in search of her brother Noah, a notorious outlaw. She’s a shrewd testy girl with an uncanny ability to shoot fast and straight and I loved her immediately. This is a debut novel although Larison writes like he’s as much of an old hand with a novel as Jesse is with a gun. 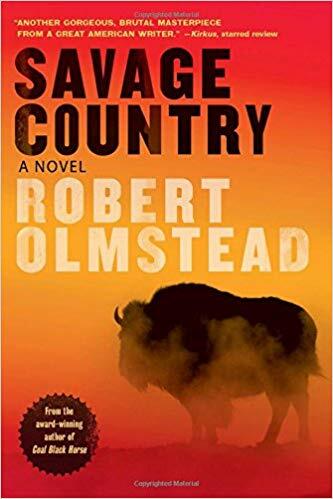 Robert Olmstead’s “Savage Country” is the story of Elizabeth Coughlin, newly widowed and about to lose her Kansas farm when her husband’s mysterious longlost brother Michael arrives, pays the debt and accompanies her on an expedition to find the last great buffalo herd and obtain financial solvency again. On this epic quest, they face Indians, hard men, weather and take their places in a West that will never come again. As Michael says, he was “part in the great vanishing and he knew it. It was as if he was taking apart the world around him one life at a time”, both with the animals as well as the men that seek to take theirs. Olmstead has achieved great acclaim and awards but Savage Country is my favorite, a eulogy to a time, place and lives gone forever. Thanks to both of these gentlemen for the great escapes. Highest recommendations.